Keywords: forensic science, phase analysis, X-ray powder micro-diffraction. The majority of analyses in forensic field deals with determination and comparisons of various evidence and materials. Often there is little or nothing known about them and in a crime lab one can meet very broad spectrum of various materials. Here lies the fundamental difference as compared with other analytical labs and institutes that are usually specialized more or less in certain material group. 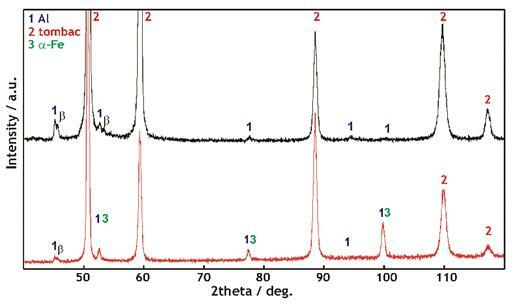 From this point of view the benefit of XRD methods is very significant, because they usually enable direct phase analysis (if the material to be examined is of crystal structure). Of course, not even XRD methods are omnipotent and are usually used in combination with other methods (mainly SEM-EDS/WDS, optical microscopy, XRF, FTIR etc.). Recently there has been a trend in the forensic field to determine the phases by minimum of two independent methods. The conclusions of expert opinions are the basis for decisions made by bodies responsible for penal proceedings, i.e. deciding about guilt and punishment, and therefore the results must be of the highest level of credibility. Here the role of XRD method is replaceable only with difficulty because it enables the performance of phase analysis on physically different principle than the majority of standard analytical methods for both inorganic and organic basis. In forensic science practice XRD methods can be used namely for analyses of mineral phases in soils, inorganic and organic phases in pigments and coating compositions, gemologic objects, inorganic and organic phases of post-blast residues, explosives components and pyrotechnic compositions, drug analysis (including semi-quantitative analysis) and other pharmaceutical and cosmetic products, building materials and their relics – abrasions, microparticles, metals and alloys (including abrasions), plastics and polymers, fillers and additives in papers and other products, and last but not least also in completely “unknown” samples (powders in extortion letters etc.). Advantages of XRD methods in the forensic field lie in their complexity, in the possibility to analyze relatively small-volume samples, in their relative non-destructiveness, preservation of material after the analysis for prospective further examinations or revisions, and a relatively precise semi-quantitative phase analysis in a mixture. Quite important are applications of XRD methods in the sphere of explosives and blaster agents analyses. Other methods can have problems with unambiguous phase analysis (e.g. azides or fulminates of heavy metals), possibly also with the specimen preparation for analysis of high explosive materials. Fig. 1 illustrates the identification of silver azide presented as unknown material from domiciliary search. Figure 1. the identification of silver azide presented as unknown material from domiciliary search (left SEM picture, right EDS spectra). 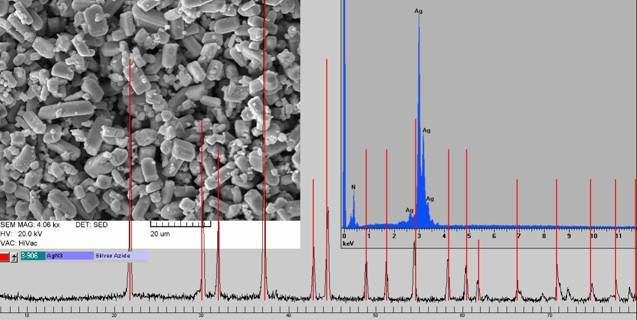 Recently, X-ray powder microdiffraction has started to gain ground. The term XRD microdiffraction appeared at the end of the 1990s. The microbeam in this case means synchrotron radiation or radiation focused by polycapillary primary optics, which gives sufficient strength for diffraction data collection from a small area in reasonable time. Test measurements for forensic application are made on an X’PertPRo diffractometer made by a Dutch company PANalytical. It is a combination of a common X-ray tube, a capillary, which focuses the X-ray beam into the diameter of 0.1 mm, and a position-sensitive detector. The application of microdiffraction in forensic field is of great importance because for the first time the size of the analyzed area is getting to the level comparable to other microscopic identification methods, and further it is possible to analyze common samples without any adjustment or change. Fig 2 shows the example of a bullet adjustment with abrasion relics of metals in the X’PertPRo diffractometer. The result of a conventional Bragg-Brentan method measurement (fig. 3 – lower curve), where the X-ray tube moves by the omega angle and the detector by theta angle on condition that w = q, showed that the most intensive diffraction line of aluminium (111) overlaps with b line from the most intensive line of tombac (111). Furthermore, well noticeable are diffraction lines of ferritic steel from bullet core cladding. The diffraction line (211) of ferrite, which lies approx. next to 100 degrees 2theta, has significantly higher intensity than would be appropriate to the structure. This can be explained by the material stress of the rolled bullet jacket. Figure 2. Example of a bullet adjustment with abrasion relics of metals in the X’PertPRo diffractometer. Another operating practice was chosen for the second measurement of the same spot to increase the contribution of surface layers to the whole analytical signal. In this case the incidence angle between the X-ray tube and the sample surface being measured was constant (w = 7°) and only the detector was moving. 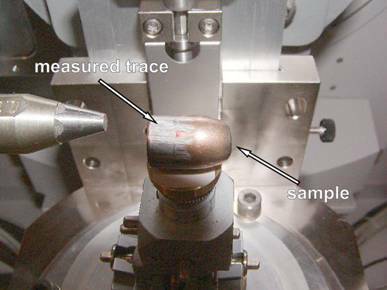 This method of measurement results in a drop of penetration depth of X-radiation into the sample (with more significant contribution of surface layers of the sample). With low (and constant) angle of incidence there is at the same time larger sample area radiated (fig. 3 – upper curve). Increase in Al contribution is noticeable and it is possible to distinguish clearly between aluminium line (111) and a tombac beta line (111). At the same time the diffraction lines of ferrite practically disappeared. Figure 3. Diffractograms of abrasions on the surfaces of 9 mm bullets Fe-tombac cladded. XRD methods at Institute of Criminalistics Prague were supported by grant-aided projects of the Czech Republic Ministry of Interior RN 19961997008, RN 19982000005, RN 20012003007 and RN 20052005001.